This portal assembles recent research on violent extremism and social media. The relationship between violent extremism and social media is contested. When it comes to ‘cause-effect’ research, some argue that social media amplifies, extends and empowers violent extremism. Social media may lower the bar for participation, enable lone wolves to embrace transnational extremist movements, facilitate recruitment, enforce fear and control. Others are more skeptical of the power of social media, on its own. It is a fact, however, that extremist groups leave behind digital footprints – information about who they are, what they do, where they do it, and who is paying attention. Some of this data could have significant potential for the prevention of violent extremism. But research is in its infancy. Methodological challenges and ethical concerns loom large. 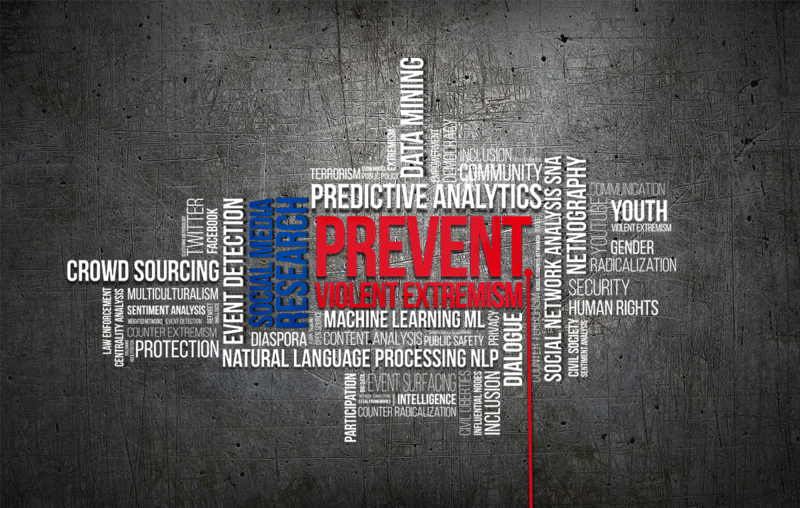 This portal is to help CVE researchers to quickly find recent research on the threats and potential of social media in the fight against violent extremism. The portal’s creation was funded by a grant from Public Safety Canada’s Kanishka Project. This event was co-organized by the United Nations Counter-terrorism Executive Directorate (UNCTED), ICT for Peace Foundation (Switzerland) and the SecDev Foundation (Canada) as part of a global engagement project working with industry, and key stakeholders to develop community standards around the prevention of violent extremism online consistent with UN principles, including the Universal declaration of human rights, and UN Security Council resolution 1325 on the role of women in peace and security. On March 6th the CIC National Capital Branch, in cooperation with the SecDev Foundation, hosted the event, Women, Violent Extremism and the Internet: Empowering Prevention; Dealing with Risk. The video recording of this event is now available below as well as via CPAC and YouTube. Our panel of experts discussed the complex role of women in the prevention of violent extremism, with a special focus on the role of the internet in amplifying this impact, and also in channeling the risks. The discussion also focused on the role that Canada can play in the context of UN Security Council 1325, strengthening the role of women in peace and security, especially on counterterrorism and the prevention of violent extremism. Dr. Sanam Naraghi-Anderlini is the Co-founder and Executive Director of International Civil Society Action network and an adjunct professor at Georgetown University. She has served on the Advisory Board of the UN Democracy Fund (UNDEF), and was appointed to the Civil Society Advisory Group (CSAG) on Resolution 1325, chaired by Mary Robinson in 2010, and was the first Senior Expert on Gender and Inclusion on the UN’s Mediation Standby Team. Since 2013, she has served in the Working Group on Gender and Inclusion of the Sustainable Development Network and provides guidance and training to senior personnel in UN agencies, governments and NGOs worldwide, and works is in conflict-affected countries globally. Brette Steele serves as Deputy Director of the U.S. CVE Task Force, which coordinates efforts to prevent violent extremism in the United States. Prior to establishing the CVE Task Force, Brette served as Senior Counsel to the Deputy Attorney General and coordinated the U.S. Department of Justice’s efforts to build community resilience against violent extremism. Brette also chaired the U.S. Department of Justice Arab- and Muslim-American Engagement Advisory Committee and vice chaired the Attorney General’s Advisory Committee on the Employment of People with Disabilities. Brette graduated with a B.A. from University of California, Berkeley, and a J.D. from UCLA School of Law. Naureen Chowdhury Fink is a Policy Specialist on gender and counterterrorism/CVE at UN Women and CTED, and has spent over a decade focusing on the international and multilateral response to terrorism and the role of the United Nations and its partners. Previously, she worked for the Global Center on cooperative security and the International Peace Institute, where she developed the counterterrorism portfolio and published on international efforts to promote deradicalization and countering violent extremism, regional counterterrorism cooperation in South Asia, terrorism and political violence in Bangladesh, and the UN counterterrorism program. She has worked with the Middle East Programme in Chatham House and the World Intellectual Property Organization and World Trade Organization in Geneva. She holds a BA from the University of Pennsylvania, an MA from the Courtauld Institute of Art, and an MA in war studies from King’s College London. Renee Black is the founder and executive director of PeaceGeeks, a non-profit, volunteer organization that supports grassroots non-profit organizations promoting peace, accountability and human rights in obtaining the technology and tools they need to have the greatest possible impact in their communities. She holds a Bachelor of Commerce (Hons) from Dalhousie University and a Masters of International Affairs (Hons) from the University of Ottawa. She worked on the Women, Peace & Security framework with the United Nations and with the Global Network of Women Peacebuilders. She is a Fellow of the United Nations Alliance of Civilizations. The discussion was moderated by Rafal Rohozinski, senior fellow for Future Conflict and CyberSecurity at the London-based International Institute for Strategic Studies. He is also the CEO and Chief Innovation Officer at SecDev and co-founder of SecDev Foundation where among other things he led the work on Countering Violent Extremism online under the Government of Canada’s Kanishka programme. What are the drivers of violent extremism on-line? What do we know about its impact? How do we engage industry and leverage the potential of modern analytical techniques to create capabilities to monitor for “risk factors” while remaining consistent with important principles as the United Nations Universal Declaration of Human Rights? One option is to adopt the WHO public health surveillance model to tracking risk factors in on-line media. Doing so will require developing an OpenData standard for social media data for community security – and buy-in from major social media platforms to participate in such an effort. Rafal Rohozinski is the CEO and Chief Innovation Officer at SecDev Group and co-founder of the Secdev Foundation. He is also a senior fellow for Future Conflict and CyberSecurity at the London-based International Institute for Strategic Studies. These remarks were delivered at a special meeting of meeting of the United Nations Counter Terrorism Committee, UN Security Council, 1 December 2016, and draw upon a recent Secdev/UNDP study of terrorist use of social media in Bangladesh.